“The answers to our problems don’t lie beyond our reach. They exist in our laboratories and universities; in our fields and our factories; in the imaginations of our entrepreneurs and the pride of the hardest-working people on Earth,” U.S. President Barack Obama said in a joint session to Congress exemplifying our American ingenuity. There is rare talent ingrained in the American workforce. Every day we find ways to become more sustainable, to rely less on others. We are the most independent nation on this planet and pride ourselves on our freedoms and choices. But we’re holding on to a status quo that directly contradicts our way of life. While our freedoms define us, in this age, so do our dependencies. It’s absurd to think that with a perfectly capable workforce, we rely on a foreign source for our energy. A foreign dependency that contributes to the very people we need to defend ourselves against. But we continue to import nearly 12 million barrels of oil every day. And it’s been happening for decades. In the early ’70s, I recognized our growing dependence on imported petroleum and wrote a paper for the Army leadership warning that this dependence might someday necessitate deploying U.S. military forces to the Persian Gulf. Many at the time thought it was a far-fetched idea. The United States is now spending $137 billion a year on military efforts to defend oil and natural gas reserves across the globe — those are hard earned tax payer dollars that could be used instead to create jobs here at home. As President Obama says, it’s “in our fields and our factories.” The American farmer, who has provided our country with nourishment for decades, can also be relied on for this energy source. The realization that we can and will have both has yet to be accepted. This investment in our rural communities to grow our fuel right here at home is the economic boost our country needs. It’s time that we let go of inaccurate accusations and outdated regulations and instead, let our country prosper. The wars in Iraq and Afghanistan serve as constant reminders of the power foreign petroleum has on our nation. Without a change, our dependence on foreign oil will continue to cost us jobs, jeopardize our national security and threaten our environment. After devoting several years of my life to the betterment of this country, I’m excited to be continuing that work with POET through the moral purpose organization, Growth Energy. We’re working to create American jobs here at home, decrease dependence on foreign oil and protect our environment for future generations. It is our ingenuity and determination that will power our transition toward renewable energy and lessen our dependence on foreign oil. It is time for action and to move America toward a more promising energy future. 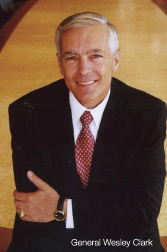 General Wesley Clark serves as Co-Chairman of Growth Energy. He rose to the rank of four-star general after nearly 40 years of service in the U.S. Army. As NATO Supreme Allied Commander he led NATO forces to victory in Operation Allied Force, saving 1.5 million Albanians from ethnic cleansing without the loss of a single American soldier.